As pilots we all know that oxygen is important to aviation safety and comfort. And, there are rules about the required use of oxygen by the pilot after 12,500 feet for more than 30 minutes or anytime above 14,000 feet. But, that doesn't mean that you can't begin to have low oxygen saturation at much lower altitudes. Flying as low as 5,000 feet, the body will start to demand more oxygen and functions like night vision can begin to be impaired. If you aren't flying with a portable oxygen system, keeping a Boost Oxygen can handy can be just the answer to keep you safe in the air and feeling better after landing. The average purity level of Oxygen in the air is 21%. Booost Canned Oxygen is 95% Pure! And, just a few deep breaths of Boost Oxygen helps you stay at your best. It is all-natural, and contains no caffeine, no calories or any other unnatural stimulants. 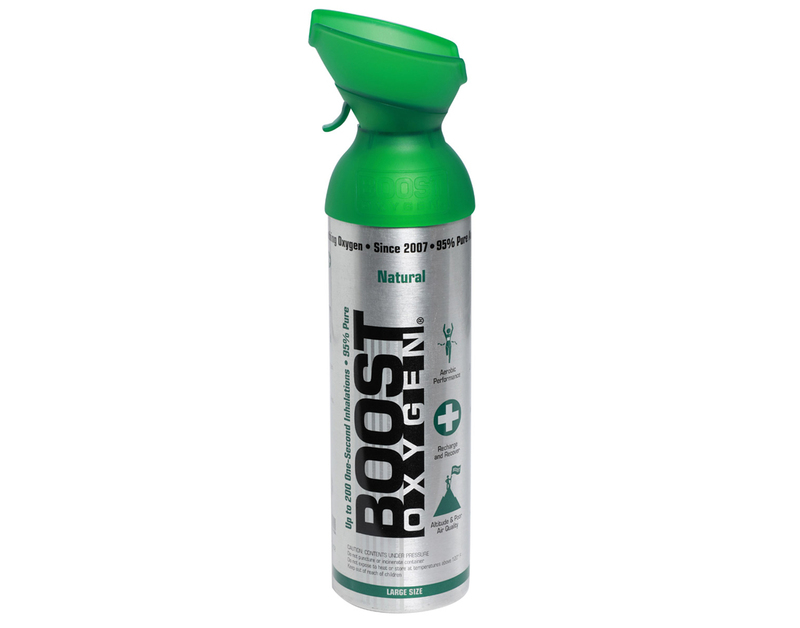 This single 10 liter Boost Oxygen can has a built-in, connected, mask that provides up to 200 one second inhalations. Use in in conjunction with a portable Pulse Oximeter to stay in peak condition! Natural (unscented) flavor. Review: The oxygen product is a great emergency need for those who do not yet qualify for prescription oxygen. MyPilotStore is the best place to make this purchase because they get the product to you quickly as there very well could be an emergency. I have been very happy with their performance. Review: [This review was originally written for the 22 ounce can that was replaced with this 10 liter] Gets the job done, but I think it would be better if the top mask part were made to fit over the nose rather than the mouth. Also if it were somewhat rubberized rather than hard plastic, hard to imagine I am getting any sort of a good fit. Looking forward to testing it out on a night flight soon! Review: [This review was originally written for the 22 ounce can that was replaced with this 10 liter] A great pick me up. Pros: It helps me breath better. Review: [This review was originally written for the 22 ounce can that was replaced with this 10 liter] Boost really works I bought 3 cans and am astonished that I am not out of the first can yet after 5 days. I am an ex smoker so this is a nice pick me up! Thank you! Just what I needed! Review: [This review was originally written for the 22 ounce can that was replaced with this 10 liter] I think this will be just what I need..and the service was so fast!!! I'll be ordering more. Review: [This review was originally written for the 22 ounce can that was replaced with this 10 liter] Please be aware that the airline will not let you check these in your luggage or carry them on the plane! They consider them compressed oxygen. if you need them while out skiing, you will have to ship them to your destination. It was a good thing that I called Southwest to ask where to pack them or I would have lost an entire case of these. Review: [This review was originally written for the 22 ounce can that was replaced with this 10 liter] Arrived quickly, fits easily in side door, pressure seems great- no worries about bursting but good pressure. Seems like very quality product. I'll order more. Review: [This review was originally written for the 22 ounce can that was replaced with this 10 liter] it was as I expected,good for emergency use Great for those 11-12000 flights as a refresher! Review: [This review was originally written for the 22 ounce can that was replaced with this 10 liter] I have compared this product to oxygen 4 energy (a 4 liter slim bottle). Boost seems to have low air pressure and the mask provides for suction of external air. VErsus the competition, you get a blast under higher pressure so you know you are getting everything from the bottle. Pros: That is relatively low compression, so it is unlikely to explode in the cockpit. Review: [This review was originally written for the 22 ounce can that was replaced with this 10 liter] The "22 ounce can" actually weighs about 4.3 ounces. The can's Contents lists the weight as "Net Wt 7 grams". It is so light, you won't have to worry about your weight and balance calculation. "22 ounces" seems to refer to fluid ounces, the size of the can, not the amount of O2 in the can. The can is labeled "6 litres"(sic). A liter is about 33.8 fluid ounces...half of that 2-liter soda bottle in the frig. So how much O2 is in the can? Well, it claims to be 6 liters of O2 compressed into a container that is around 2/3 of a liter. The advertising literature claims there are 120+ squirts in the can. A normally healthy adult is taking around 10-20 breaths a minute. So best case scenario, you get about a 10 minute supply of O2. Cons: The only complaint is that there is no price break at all on volume/continuous purchases. Was this review helpful to you? Yes No 13 Other people found this review helpful. Cons: I don't have any yet. Was this review helpful to you? Yes No 40 Other people found this review helpful. Was this review helpful to you? Yes No 22 Other people found this review helpful. Was this review helpful to you? Yes No 28 Other people found this review helpful. Was this review helpful to you? Yes No 48 Other people found this review helpful. Was this review helpful to you? Yes No 39 Other people found this review helpful. Cons: That is relatively low compression, so there really isn't much in the can. Was this review helpful to you? Yes No 106 Other people found this review helpful. Keeping a Boost Oxygen can handy can be just the answer to keep you safe in the air and feeling better after landing. A lightweight, inexpensive monitor for measuring blood oxygen saturation and heart rate during high-altitude activities.